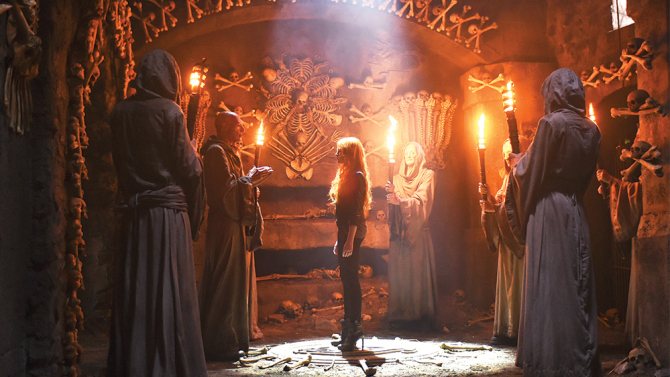 A new still from the second episode of Shadowhunters has surfaced, which features our lead heroine Clary (Katherine McNamara) with the Silent Brothers in the City of Bones. The shot was featured in a Variety article which discussed the new wave of genre adaptations on television, after the likes of Game of Thrones and The Walking Dead have proven successful. That last bit about Ed Decter scares me. It scares the crap out of me. I mean, they have the right to change it up a little, and adding stuff that was cut from the movie would be cool, but the way that was worded… “do more than pay lip service to a fandom”, “go sideways a little with the story” … It gives me a bad feeling in my stomach. Maybe I’m nitpicking, but it bothers me that they put Clary in spike heels. It’s not something her character would wear, it’s something Izzy would wear. I just really want them to be as faithful as possible. I will hold off judgement until I see the show though. is that brother zachariah I see???? So Stephen Hart is a Silent Brother again- there’s one film cast member guys!